For early (pre-1974) Alice Cooper band releases, see the group Alice Cooper. Alice Cooper (born February 4, 1948, Detroit, Michigan, USA) is an American singer, songwriter and actor. 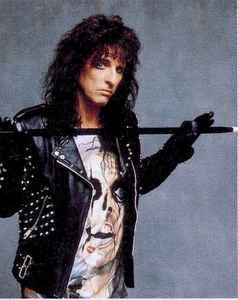 Originally named Vincent Furnier and a member of the band Alice Cooper, he later changed his name to Alice Cooper. Father of Calico Cooper (born 1981), Dash Cooper (born 1985) and Sonora Rose Cooper (born 1993). Happy 70th birthday to my favourite musical companion. Martin, Copenhagen, Denmark. Hands down my favorite rocker of all-time and still great to this very day (2018). I actually am an even bigger fan of Alice's solo career than his work with the original band. My three favorite Alice albums are probably From the Inside (1978), The Last Temptation (1994) and Brutal Planet (2000). I know some people can't seem to get past the original band and they were good but with the exception of Alice himself, the original band were somewhat limited (no disrespect intended). Most of their work consisted of rather simple riffs (an exception being Halo of Flies) but good, solid rock songs. I find Alice as a solo artist far more interesting. I love those early 80's albums, his metal phase, the hair metal phase, and what he is doing presently. An underrated singer, the man is a true icon. Love his first couple solo albums. He never quite recovered after that. Still, there are good songs on most of the rest of the albums. But they are very uneven. Why do we have an "Alice Cooper" and an "Alice Cooper (2)" when they are the same artist?